Seventy-two Valentines and counting. That’s a lot of cards and candy! If that’s the case, Allen and Christine McKean who live at The Continental in Austin, Texas may be close to breaking an all-time record for falling in love. 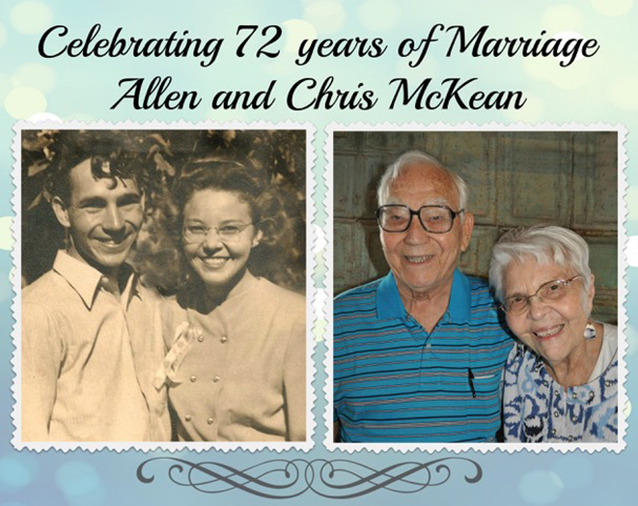 Last Saturday, February 2, the McKeans celebrated their 72nd anniversary with a family get-together at Crepe Crazy in South Austin, which is appropriate, because after nearly three-quarters of a century together, the couple is obviously still crazy in love. The love affair started back in 1946 when Allen met Christine Boyce at a 4th of July parade in San Marcos, Texas. Allen was born and raised in his parents’ one-room farm house on the banks of the San Marcos River in Staples, Texas. Chris was born in Dallas. On that fateful Independence Day shortly after WWII, she was a college student and Allen had just been discharged from the Navy. Their first home was a four-room house on Allen’s family farm, which had no running water, electricity or gas. After a year of basically camping out, they decided to go back to school in order to find jobs with more income. With the help of the G.I. Bill, they both earned their degrees. But by that time, they had two children underfoot, and Allen was called back for a second tour of duty in Korea. After that conflict was over, Allen returned and taught school for five years as their family increased to four children. He then got hired by the Internal Revenue Service and began a 25-year career with the government, which took the family to Washington D.C., Houston, San Antonio and later to the new IRS center in Austin. During that time, they added a fifth child and Chris taught school and swimming lessons when she wasn’t raising the children. Since Allen was still a country boy at heart, they built their home in nearby rural Manchaca and lived there for 42 years, becoming heavily involved in high school, college and church groups — most centering around swimming and volleyball activities. Every year, Allen went deer hunting, which made venison a staple of family meals. Together, Allen and Chris were members in both the chorale and hand bell choirs at the Manchaca United Methodist Church. They volunteered with school PTAs, and kept busy serving on many church groups and committees. For years, they never missed a game as their boys played football and the girls were cheerleaders and drill team members. In addition, Allen coached Little League baseball while Chris was Girl Scout troop leader. Vacations were spent traveling and camping with the kids as they added state car stickers to their window collection. When the children moved out and began having their own families, they became avid Texas Longhorn fans and faithfully attended Lady Longhorn basketball games with friends. Today, Chris and Allen’s relationship continues to grow around their family that has added ten grandchildren and five great grandchildren. 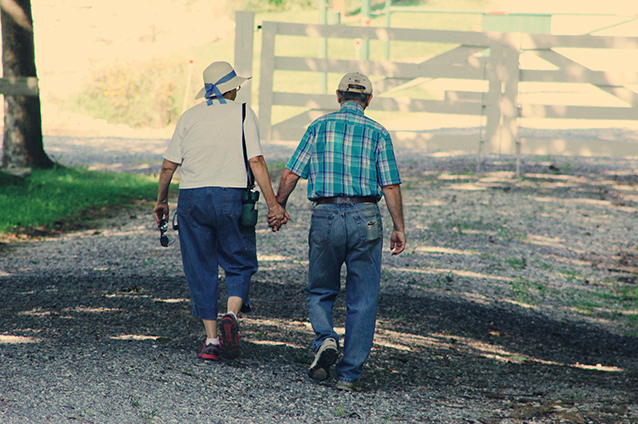 Their move to the Continental Retirement Community in Austin has enriched their lives further with staff who serve many of their daily needs and provide activities for them to create new friendships with fellow residents. To this day, the two of them have managed to strike the perfect balance of pursuing their own passions and interests, yet still focusing their lives around each other, as well as their family and friends. Far away from The Continental in Austin, there are a few couples at Quail Lodge in Antioch, California who aren’t far behind in their years of wedded bliss. Vern and Shirley Hess will celebrate 68 years together this year, hot on the heels of Allen and Chris. “It’s important to always have good communication,” says Vern. “As long as he remembers, what’s mine is mine and what’s his is mine too.” jokes Shirley. Jerry and Carol Schmalenberge’s 63rd anniversary is just four months from now. Jerry claims that being faithful Christians and going to regular worship is a bond that has held them together over the years. For Larry & Lily Stangl, who have been married 51 years, it comes down to remembering the three magic words. And not the ones you might think. “I was wrong,” says Larry. It just goes to show, couples have been giving each other cards, candy and flowers for Valentine’s Day for almost two centuries, and more than 190 million cards are sent in the United States alone each year. But clearly what makes an enduring love story is what two people give each other every other day of the year. *This blog was first published here: Sunshine Retirement Living, February, 2019.